Hi everyone! We want to encourage you to stay home today to spin, knit or crochet. We will be closed today, February 15th 2015. While it may not be cold for Minnesota it is for us Ohioans! We will reopen on February 17th at 11 a.m. when it is supposed to be a balmy 21 degrees farenheit. 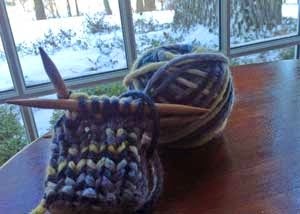 I'll be working on these mittens.